Adventure racers head back to the Rock! 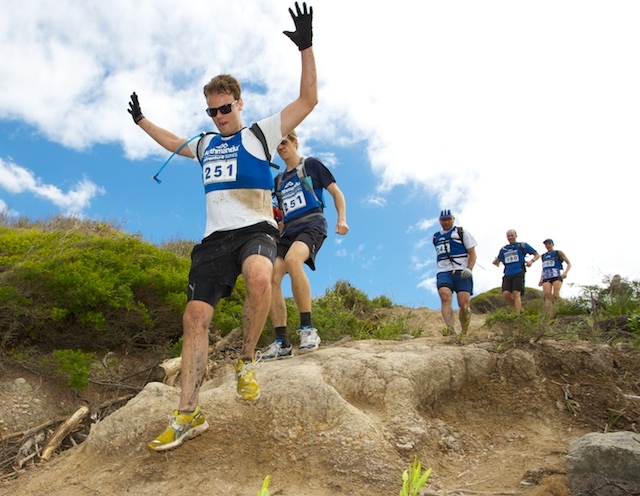 After missing out in 2014 the Glenrock State Conversation Area just south of Newcastle is back hosting an adventure race in 2015! This classic venue offers something for everyone with a brilliant coastal location easily accessible from Sydney, Newcastle and the Central Coast. The areas features some fast flowing single track mountain biking that is perfect for novices and experienced racers alike as well as the thrill of paddling on the mighty Pacific Ocean. However the real attraction of the Glenrock venue is the coasteering. Coasteering is scrambling across and over rock platforms with the occasional short swimming detour across rock pools. The coasteering legs have proved a favourite every time this venue has been used and the crew at Maximum Adventure are excited to make this a real highlight once again! Entries are now open and with the additional thrill of coasteering on top of the usual fare of mountain biking, running and kayaking what more of a reason do you need to drop everything, grab a team mate, set yourself a summer training goal and enter.